Becky Mason has been called Canada’s first lady of wooden canoes. The daughter of legendary canoeist and filmmaker Bill Mason, she’s known for her elegant paddling of traditional canoes and her beautiful watercolours. Becky Mason has been called Canada’s first lady of wooden canoes. She’s known for her elegant paddling of traditional canoes and her beautiful watercolours. 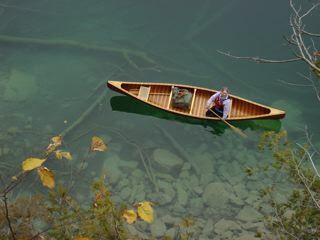 The daughter of legendary canoeist and filmmaker Bill Mason takes us on her favourite local paddle to the beautiful Lac Vert in Quebec. She takes her memories home to her studio where she paints her impressions of what she’s experienced. A charming insight into this influential paddler. 8 minutes. Shot in HD. 16 x 9.